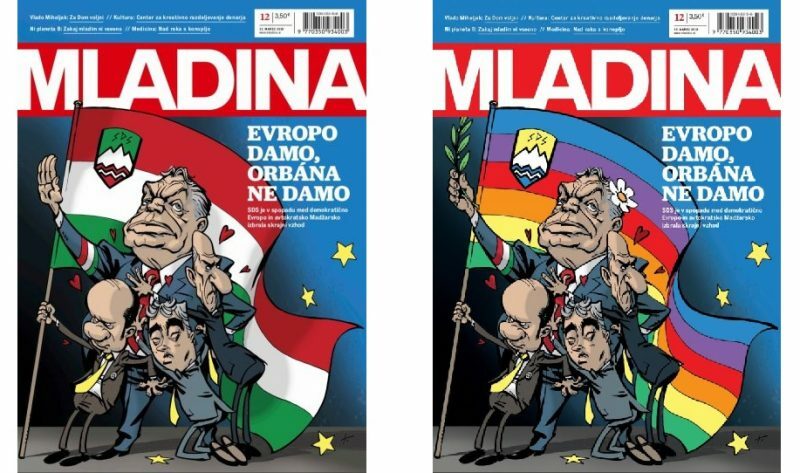 The 22 March cover of Mladina (left) featured a caricature of Slovenian far-right politicians surrounding Hungarian president Victor Orbán. The headline reads: “We would give up Europe, but we would never give up on Orbán.” On the right is a “repaired and friendly” version published online in response to Hungarian ambassador’s letter. Images (c) 2019 Mladina, used with permission. Slovenia may not be well known as a haven for free speech. But when Hungarian officials expressed outrage over a cartoon caricature of Hungarian president Viktor Orbán that appeared on the cover of Mladina, a national political magazine, Slovenian officials jumped to their defense. On 22 March, Mladina published story chronicling Slovenian right wing politicians’ support for Hungary’s ruling Fidesz party, under the mantle of the center-right European People’s Party (EPP). At a recent meeting, EPP suspended Fidesz’s membership within this largest and most powerful group of political parties within the European Union due to its authoritarian practices. The article also noted that the EPP had previously threatened Fidesz with an exclusion in April 2017, due to the Hungarian government’s various efforts to dismantle key institutions in Hungarian civil society, its drive to destroy the Central European University (CEU), and its use of anti-Semitic language in its Stop Brussels campaign. Various other media have pointed that Orbán continues to exploit anti-Semitism for political gain. The front page of the magazine featured a caricature of Viktor Orbán with his hand raised, in reference to the Empirial Roman salute in the style of Asterix comics, though a similar gesture with the palm level to the ground was used by fascists. Three SDS officials huddle around Orbán affectionately. One holds a flag with a design similar to the flag of Slovenia, whose colors had been replaced by Hungarian color scheme. National flag of Slovenia (left) and Hungary (right). Source: Wikipedia. When the magazine appeared on newsstands, Hungarian Ambassador to Slovenia Edit Szilágyiné Bátorfi sent a letter to Mladina which the magazine published in full. She accused them of undermining the friendship between the two nations with their articles about Hungary. She said it was “unacceptable” to suggest that Orbán had some connection with “the dark forces of the past” and insisted that her government has never promoted anti-Semitism. “This time, it’s more beautiful and more friendly. Long live the love between Orbán and Janša!” the editorial quipped. The new caricature shows Orbán holding an olive branch (symbol of peace) with a flower in his hair, hippie-style. The modified Slovenian flag in this version shows rainbow colors, referencing the LGBTQ flag, a symbol of tolerance. In a 5 April commentary titled “Hungary’s attempt to control Slovenian media”, Mladina noted that the diplomatic note shows how serious the situation is, and that the encroaching influence of illiberal Hungary is not only a problem for Slovenia, but for all of Europe. “A country which dares to demand from another country’s government to act against journalists means a serious security threat to the entire region,” editors wrote. Journalistic investigations in Slovenia and Macedonia have shown that Orbán’s regime has attempted to interfere with domestic politics and elections of these two countries by providing support to extreme right-wing forces. Corporate figures with proven ties to the Hungarian government have provided financial backing to alt-right media outlets in Slovenia and media partly owned by the far-right parties of both countries. And in Macedonia, Hungary facilitated former Prime Minister Nikola Gruevski’s escape from criminal punishment, after he was convicted of corruption. After Hungarian diplomats transported him through three other Balkan countries, Gruevski was granted political asylum in Hungary. The [ambassador’s] letter was just another tile in the mosaic that shows the kind of politics we have to deal with in the neighboring state [of Hungary] and what is the state of affairs in this European Union member country, which once was a union of democracy. The letter just gives us another piece of proof that it was for shame that EPP didn’t muster the strength to exclude Viktor Orbán’s Fidesz from its ranks – the issue of the headline topic which upset Hungarian politics. Following its launch in 1920 as a publication of the Youth Section of the Yugoslav Communist Party in Slovenia, Mladina (meaning “Youth”) built up a reputation of speaking truth to power. The magazine was banned by the dictatorship of the Kingdom of Yugoslavia, but re-surfaced in 1943 as part of anti-fascist resistance. During the 1980s, it became the foremost dissident newspaper in socialist Yugoslavia, challenging the system, the personality cult of Yugoslav leader Josip Broz Tito, and the then all-powerful Yugoslav People’s Army. In 1988, the Army put four Mladina staff members on trial, for leaking alleged top secret documents, but this did not result in the magazine’s defeat. The trial became the focal point of Slovene resistance to abuses, inciting massive protests and fueling the drive for independence and demands for democracy. After Slovenia declared independence, Mladina survived the transition to democracy, continuing to keep the political elite accountable. For instance, they have meticulously scrutinized the work of their former reporter Janez Janša (one of the four convicted in the famous trial), who became a politician in 1989. He was appointed a defense minister of Slovenia in 1990, and twice served as prime minister (2004-2008, 2012-2013). Today he is the leader of Slovenian Democratic Party, a member of European People’s Party and close ally of Orban’s Fidesz. As such, he was featured on the controversial front page. Hungarians have been writing on Mladina’s Facebook page all day, either apologizing for Orbán, or asking to purchase “the infamous” 12th issue, or proposing selling t-shirts with the image.